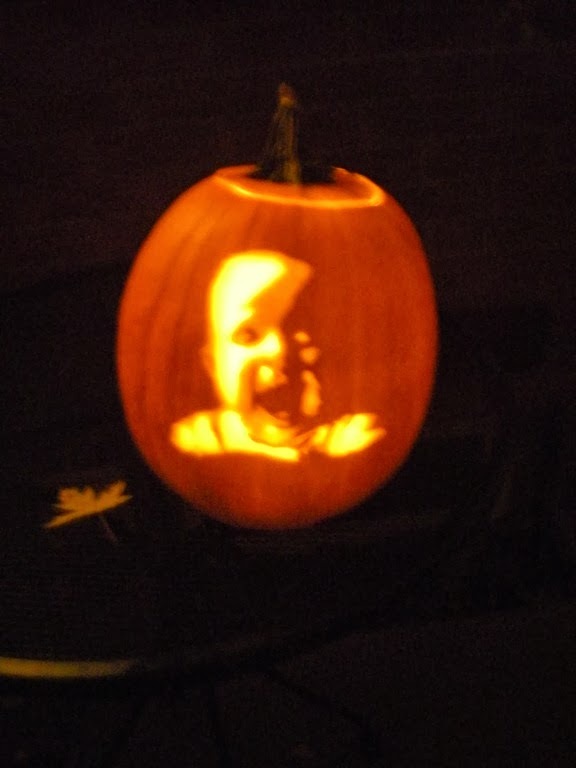 I am no expert by any means, but here is how achieved my carved pumpkins. For the first- I used a photo of Jim Leyland that I got from Google images. In the past I have used family members only. I've done everyone in our family except for my oldest. I was so bummed because I couldn't find any pictures of the one I did of Noah. I love doing faces. When you are going through the process is doesn't look like anything. But then you turn out the lights and put a candle in it....it's magical. Find a photo that is a good candidate. Sometimes you don't know if it is or not until after you go through the process. You can probably use any photo editing program but I use Photoshop. Desaturate (turn b&w) the photo. Then you go under the adjustments tab and select Posterize. A box will come up and you want to make sure the number 3 is selected. This means there are only three levels of color to the photo- gray, white and black. 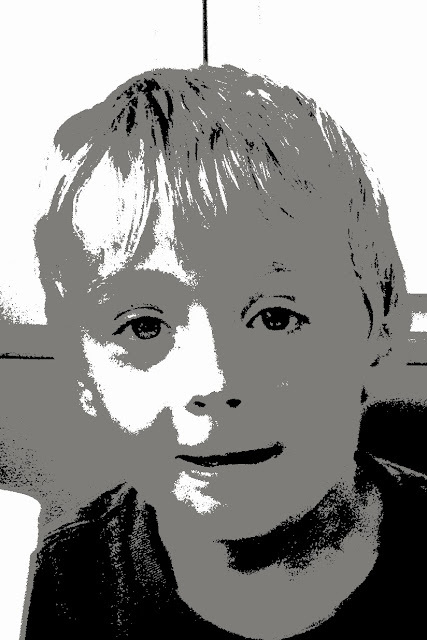 This is the photo I used when I carved Noah. The white is where you cut all the way through the pumpkin. 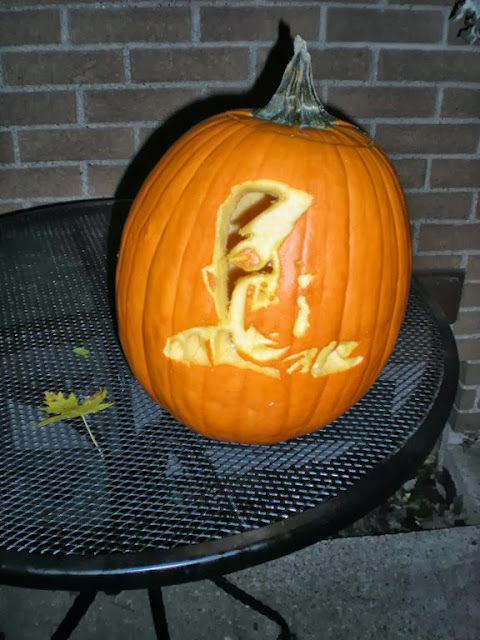 The gray you shave off the skin and the black you leave the pumpkin as it is. 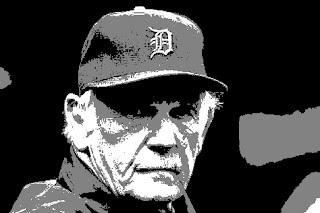 This photo of Jim Leyland wouldn't work because there is too much white. The gray needs to be attached some place and can't be surrounded by so much white. The one big tip I would give is to scoop out the center of your pumpkin first. On the side you are doing your face, really scrape the inside of the pumpkin to make it thinner. That way when you shave off the for the gray parts, the light is able to come through some. I usually tape my picture onto the pumpkin. I used to always use a little orange poker (comes in packaged carving kit) to transfer my design onto my pumpkin. These is very tedious and not very accurate for tight areas. It is not easy to tape a flat piece of paper to a round pumpkin! This year I decided to trace my photo with this tool that I picked up at an estate sale. I got it for a couple of bucks. It says it is an electric engraver. It worker pretty good but the line was hard to see in some places. I remove the picture and start cutting away. I usually cut the white parts out first and then shave off the gray areas. My main tools are a carving knife and wood carving tools. This year I picked up this kit at Hobby Lobby. I wanted to try a 3D carving. With this style you don't empty out the insides. You can draw the face you want or just work free hand. Then you start taking away the recessed areas. You need to keep in mind what sticks out the farthest- like the nose and make sure not to shave there. I watched a youtube video about a guy with the last name Villafane that appeared on Martha Stewart. He gave some good tips on how to get started. He does some amazing things. If you didn't see- here are the two I did this year. Let me know if you have or plan to try any of these!